Having premiered at the Edinburgh Film Festival, the movie went on general release in May 2017. 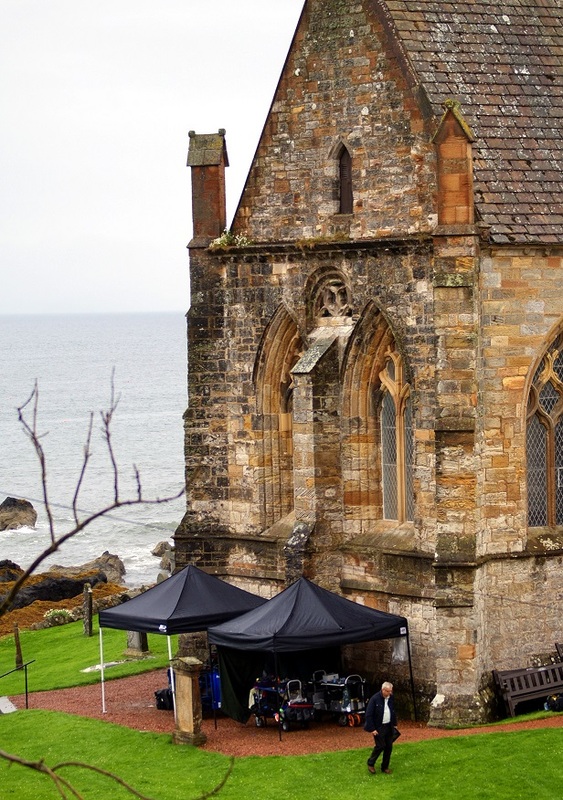 Film locations include Fife as the production team de-camped to St. Monans Auld Kirk. St Monans is a fishing village in the East Neuk of Fife complete with a windmill. The church dates back to the year 875 and the current church is reckoned to look pretty much as built by King David II in the 1300’s. It’s a kind of poetic justice that the church is a film location in Whisky Galore. It was re-built after being damaged by fire during an attack in 1544 when the village’s fishing fleet was destroyed. There’s more about St Monans and the East Neuk at Welcome to Fife. The movie stars comedian and actor Eddie Izzard, Gregor Fisher, Sean Biggerstaff (Harry Potter) and Naomi Battrick. It also features James Cosmo (T2 Trainspotting), Kevin Guthrie (JK Rowling’s Fantastic Beasts and Where to Find Them) and Ellie Kendrick of Game of Thrones. Whisky Galore is based on the novel by Compton Mackenzie from 1947 and is based on a true story about the SS Politician running aground off the Hebrides with a cargo of whisky during World War 2 when supplies of Scotland’s national drink were running low on the island. A Home Guard commander played by Izzard has to try to ward off efforts by the island residents to retrieve the haul. National newspaper the Scotsman MyCompany Quarterly Reported that Izzard did not realise it was a true story thinking “it sounded too outrageous”. The movie is directed by Gillies Mackinnon, produced by Iain Maclean and Alan Wands and written by Peter McDougall. Director of Photography was Nigel Willoughby. There/s more about the team and the production at the Whisky Galore website. Take a look at the trailer at Youtube. At TayScreen, we did our usual thing, supporting the production. We’re the screen office for Angus, Dundee, Fife and Perthshire, here for free help with locations, services and crew. Give us a try for location ideas for your next project.